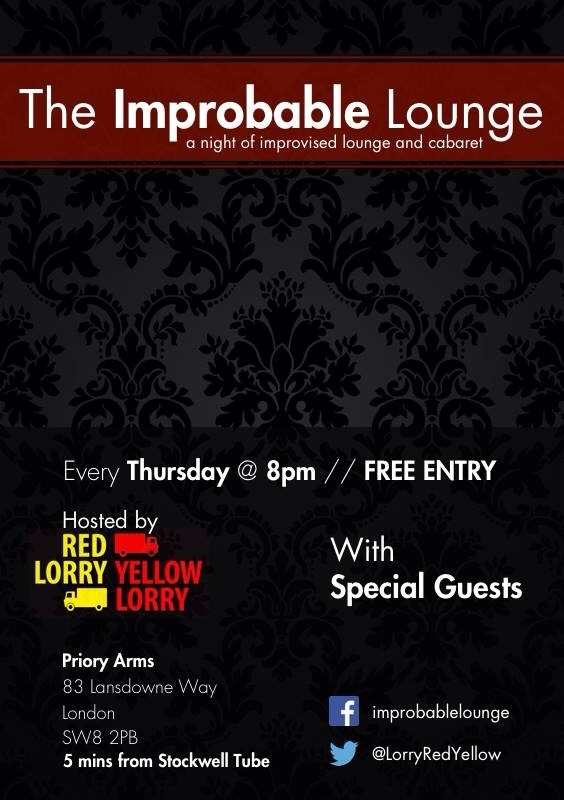 We had another fabulously fun time at the Improbable Lounge on Thursday (6 March) – make sure you join us on Thursday 13 March for more musical improv & cabaret delights. We will be having our very first burlesque act – with a comedy twist. That's the talented Ursula Dares. And musical comedy ukulele action from Improbable Lounge favourite Marc Steele. Plus the usual (but still all made up on the spot taking your suggestions) improvised cabaret tunes from your hosts, us – Red Lorry Yellow Lorry musical improv. This week we have the amazing Glitch – the improvised puppet show. Plus improvised lounge act Phil Lunn. It's all held together with magical musical cabaret tunes made up on the spot, from your suggestions by Red Lorry Yellow Lorry musical improv. That's us, your hosts! We start at 8pm as usual, and the Priory Arms will be its usual cosy self, stacked with posh beer and other liquids (I'm a white wine girl myself), and even does great and reasonably priced bar food..
We are counting down the days to the launch of our brand new weekly comedy improv night. The Improbable Lounge is a night of toe tapping comedy improv fun. Improvised lounge & musical cabaret acts – with a couple of quirky variety acts….our launch night will also have its own festive singalong. Because it's Christmas. And because we can. But mainly because it's Christmas. We're thrilled to have the dulcet tones & tinkling ivories of Phil Lunn, and his improvised comedy lounge act. Plus we have musical comedy cabaret from Siobhan Dodd…and some surprise guest acts. Of corse it's hosted by the inimitable Red Lorry Yellow Lorry musical comedyimprov. But best of all it's all free free free! So get thee down the Priory Arms in Stockwell on 19 December, by 8pm.